North America's most popular portable propane heater! This patented radiant 4,000-9,000 BTU Liquid Propane heater connects directly to a 1 lb cylinder and is the perfect solution for heating enclosed spaces like large tents up to 200 sq ft. The expertly engineered size to BTU ratio is augmented with a fold down handle to give this heater maximum output while retaining a minimalistic footprint. North America&apos;s most popular portable propane heater! 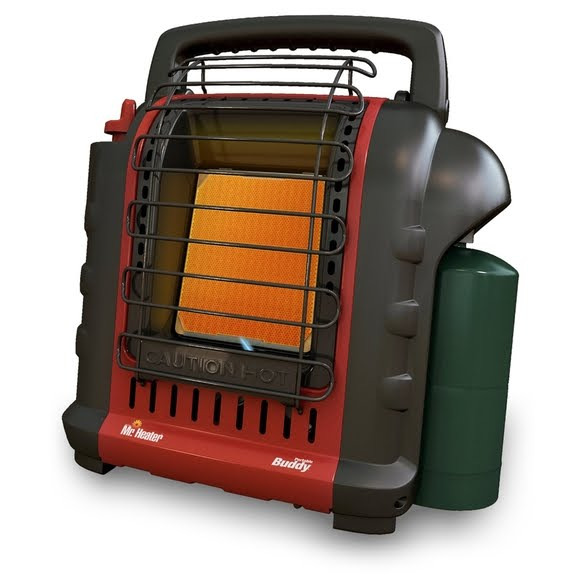 This patented radiant 4,000-9,000 BTU Liquid Propane heater connects directly to a 1 lb cylinder and is the perfect solution for heating enclosed spaces like large tents up to 200 sq ft. The expertly engineered size to BTU ratio is augmented with a fold down handle to give this heater maximum output while retaining a minimalistic footprint. A swivel regulator gives you the ability to adapt usage from a disposable cylinder to a remote gas supply with the purchase of a hose and filter. To light the unit, simply rotate the knob to pilot and push. Then the integrated Piezo sparking mechanism will take care of the rest. With the Oxygen Depletion Sensor (ODS) and accidental tip-over safety shut-off you can be sure that you will enjoy years of comfortable indoor safe heat. Not for sale in Massachusetts or Canada. Measurements Length 14.25", Width 9"